The Cape Honey Bee … Survival of the Fittest? What’s the point? They’ve gone. Then, in December, we fly back to the Cape again. This time we land flat-bang into the hurly-burly of the pre-Christmas season. Christmas comes. With it arrives family from far and wide. All want to be together in this isolated place, where the antelope and the zebra roam, and the wild Atlantic Ocean runs roughshod onto the rocks. Christmas goes. Family and friends depart. And still I do not go to my hive. We’re all getting old now, my cousins and I. Time to dream, and time to do what you have always wanted to do. 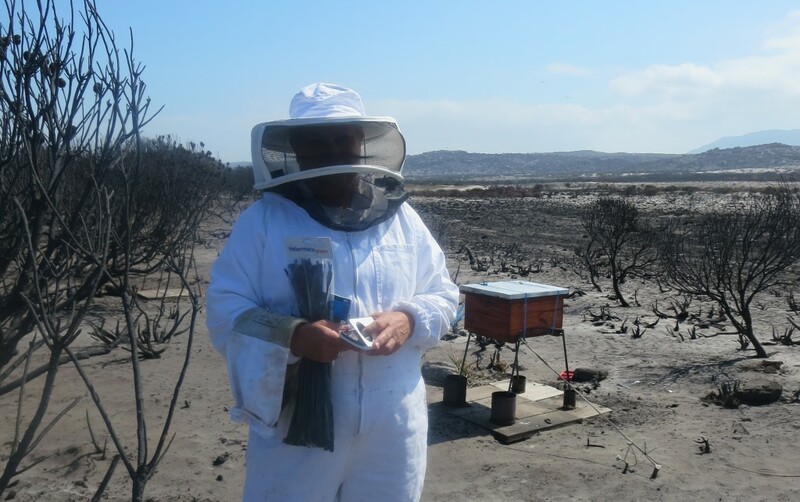 After the fire one of my cousins becomes passionately interested in bee-keeping. For some reason all my cousins have nick-names. This one’s Bulldog. Bulldog does a lot of research, and in the spring of the September sunshine he brings two ‘Best’ hives down. Not wanting to disturb our fragile eco-system in any way he simply spreads bee-lure on the inner frames and leaves them empty. ‘A leap of faith and some swarm looking for a home may just take occupation …’ he tells me. The Best hives are near the skip, a far distance away from my hive. When I was a child there was no such thing as a skip. Behind each house we dug deep dirt-holes in the veld. All rubbish went into those holes, everything, and although there was no such thing as recycling, we had our own very special recycling team. The baboons. Into the dirt-holes they would go, happily tossing out tins, fish bones, bottles and paper – until they found the tasty bits of water melon skins, sweetie papers and anything else suited to a baboon palate. But now we have a regular skip, brought down by a commercial firm. 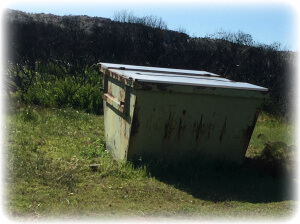 It has two sturdy lids and a strong locking bolt so that no domestic debris can be strewn across the veld. Not much fun for our baboon recycling team, but at least they won’t need a dentist. Late one afternoon I walk over to the skip, carrying some rubbish. I am worried about my cousin’s siting of these new Best hives. In my opinion they are too close to the skip, and it is in the way of their natural ‘bee-line.’ When a new worker leaves the hive for the first time, he plots his position, rather like a GPS. From then on he will push his personal sat-nav button and come straight in from there. This skip is a clumsy great thing in the way. I struggle to lift the lid of the skip. The wind is howling and the lid is heavy. I just manage to hurl the rubbish in. ‘The Cape Doctor is really here in force’ I think. The Cape Doctor is the local name for the prevailing summer wind … frequently gusting 60 – 70 knots. Locals say not only does the south-easter blow all the rubbish into the sea, it blows the germs in too. I turn into the wind to look at cousin Bulldog’s hives. For the past ten days I’ve looked at them, but there is nothing there, no sign of life. Even if I bang on the lid. 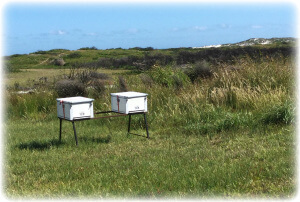 The two hives have their backs to the south-easter but they are very exposed. 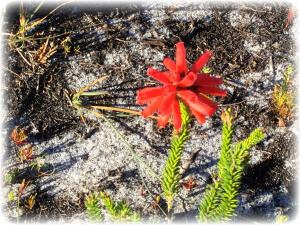 Even when the veld eventually grows up, these will still be on the flat grass, with no hope of protection. I watch the hive nearest the sea. ‘Perhaps he has put them here and not under the protection of new bush so that , if we have another fire, they won’t meet the same fate as mine’ I think. Then, still leaning against the skip for protection, I see a bee career past me. It looks as if it is on a roller-coaster ride as it does a spectacular loop-de-loop and heads straight into the hive on the sea side. ‘Crikey’ I think, ‘some-one’s moved in!’ Later my son Anton goes and sits on the grass and watches. Yes, they’re in. And still I do not go to my own hive. I just can’t bear to. In the final glow of the evening I walk through the veld. All around me is a soft carpet of green. 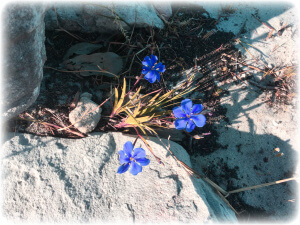 In amongst the bare white sand tufts of vlei grass have appeared, and exquisite little veld flowers. Like sentries high above them stand the blackened branches of the giant protea and leucodendrum bushes. They’re full of charcoal, and spiky. I pass them cautiously, pushing a path through to my hive. I stand to one side, watching the entrance, and thinking about that terrible fire months ago. What actually went on in that burnt old hive, I wonder? And what did happen to that tiny nucleus of bees and molten honey that I, perhaps foolishly, tried to save? The hive is still tied down against the wind and the wild animals, and the little orange plastic bowl that I filled with water still lies stuck in the blackened sand. For me evening time is a quiet time, a sombre time, a time for reflexion. Homecoming time. And that is exactly what I saw. Suddenly one, two, three beautiful bees – for all the world a working team, appeared out of nowhere, their little legs laden with pollen. They settled comfortably on the entrance that I had reduced for them months before. Then they stepped inside. A new swarm? Hardy descendants of the old swarm? Survivors of fire, of robbers, of black ants and of baboons? Walking back towards the warm light of my god-daughter’s house I could not help but feel that they are indeed the survivors … for surely only the tough pull through on this unforgiving tip, at the very edge of the African continent. Posted on January 25, 2016 March 25, 2016 Categories Beekeeping, Cape of StormsTags Beekeeping, bees, cape fires, Cape Of Storms, cape town, honey bees, table mountain4 Comments on The Cape Honey Bee … Survival of the Fittest? 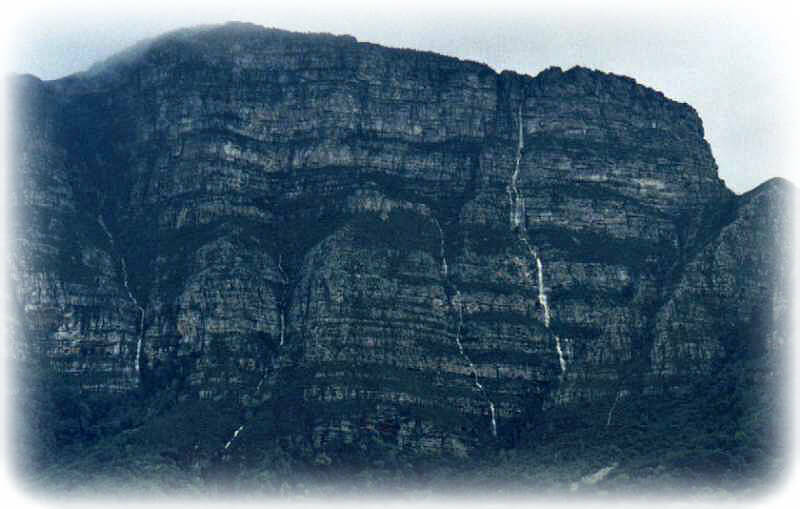 If you sail into the City of Cape Town, dominating the landscape will be the majesty of Table Mountain. But behind the famous ‘Table Top’ the scenery is equally spectacular. Here the mountain ranges in folds down towards the south, crossing deep ravines and skirting above the Kirstenbosch Botanical Gardens. In winter these ravines turn into spectacular waterfalls, rushing and tumbling headfirst towards the sea. In summer the mountain does not lose its greenness, but all is quiet and still under the heat of the African sun. I was sitting on the terrace of the Vineyard Hotel having breakfast with my cousin Suzanne when she looked up at the mountain. “Funny,” she said, “looking at this spectacular sight it is hard to believe that, just a little further along this mountain range, it all is charred and blackened.” Last week’s ravaging fires were still uppermost in our minds. “What about your bees?” Suzanne asked. So I told her. I told her how the previous week, the day after the fire, I had found a small nucleus of melted brood frames and dead bees. How I had lifted the congealed mess up and examined it closely, feeling utterly devastated for my once healthy, busy hive. Then, how I had almost unbelievably seen one whole and traumatised bee climb through the charred brood and into the sunlight. My only thought was that these tiny creatures had fought a long and brave battle against the heat – fanning their queen and protecting their last bit of honey around her. Then a few drops of honey dropped onto the sand and I was convinced. Where there was one bee there must be others. 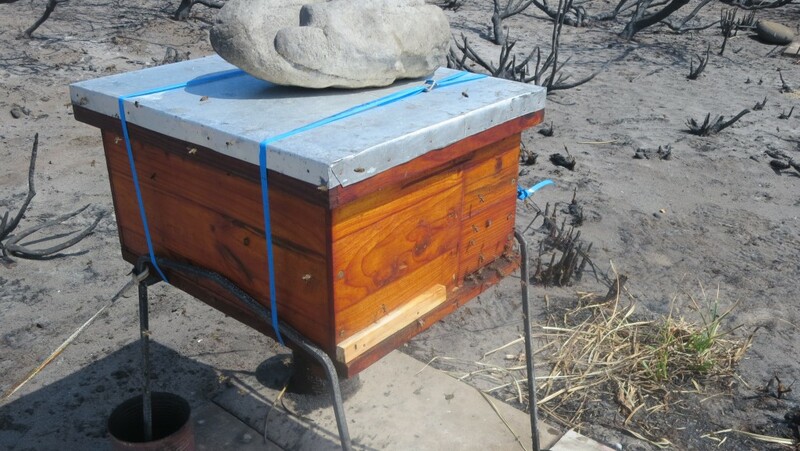 So I took a giant leap and re-hived the congealed mess, put the hive stand in tins of oil for the black ants, tied it down for the baboons and put a heavy rock on the top for the raging south-easter. Then I had to leave. 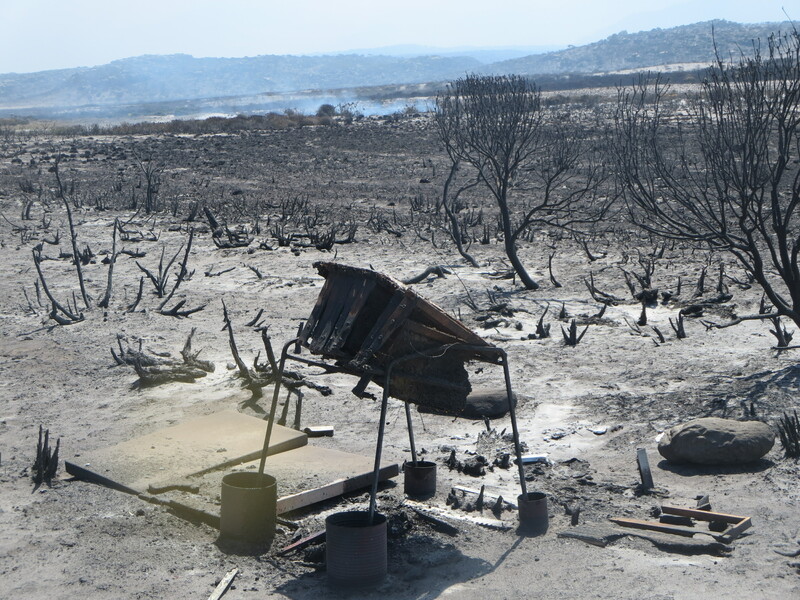 The drive down took us over mountains, through valleys and along the sea Most of area was charred and blackened, simply ravaged by the worst veld fire imaginable. We were silent as we drove, each immersed in thoughts of the suffering that it had brought with it. Community spirit in the Cape has been high. Someone I know even took his prized rugby tickets for an important game to the local fire station. There he offered them to the brave firemen who had fought day and night for seven days. Sadly, one of our most experienced helicopter pilots tragically lost his life when his helicopter malfunctioned and plunged earthwards while water-bombing the blaze. “And here I am worrying about a bee.” I thought. It did seem out of proportion, but by this time we had arrived. It was a simply stunning day … one of these days that are few and far between … for on this battered tip of Africa winds can range from a 60 knot off-shore southeaster to a 60 knot on-shore northwester. As we walked through the charred and desolate veld the still calm was almost eerie: the peace of today, and the raging crackle and power of last week, contrasting starkly in our minds. Within sight of the hive we stopped short, not believing what we saw. There was huge activity around the hive. We walked closer – buzzy bees were everywhere, all around the hive. “Better kit up.” I said, and we walked back to the house. Kitted up in our bee suits we went closer. Huge activity – bees coming and going through both entrances. What an incredible change from the last visit! “You go,” I said, “I’ll stay here a little longer”. I settled back on my haunches and watched the movement in and out of the hive, trying to work out some sort of pattern. It was then that I noticed a bit of fighting. Or did I? This particular brood box has two openings and a solid centre. I took my bee tool and slid it across the one opening and watched. Yes, more intense fighting was happening on the only entrance available … I thought, but was it just optimism on my part? In one of my beekeeping books I remember reading that if you have robbers and a weakened swarm you need to close up half the entrance to give the bees a chance to concentrate their defence. Rather like an army that cannot fight effectively on two fronts. I walked back to my store room. 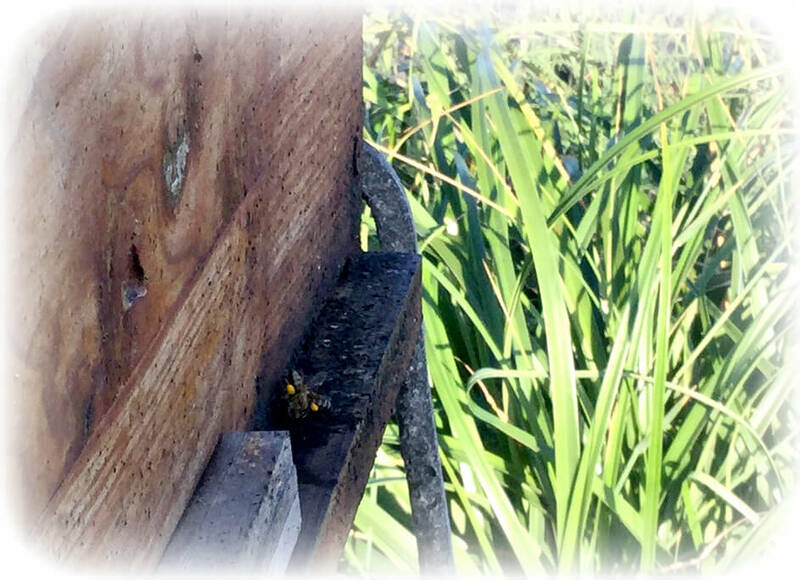 Once again I took a leap of faith – for was this my ever optimistic nature willing there to be bees in my hive ready to start again, or were these just wild robber bees trying to find feed as best they could? I do not know, but once again it seemed worth a try. I found a piece of wood and two panel-pin nails and a hammer. Robber barricade securely in place. “See you in September.” I whispered. Coming next: What happens in September … sign up here to be notified! 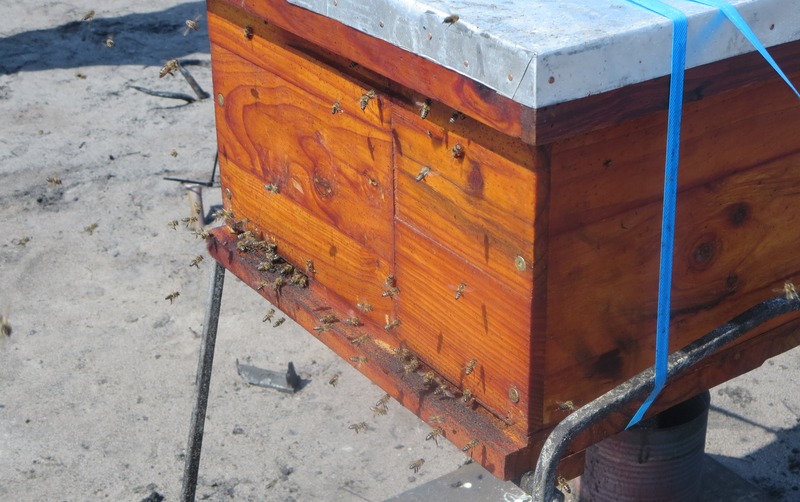 Ever since I discovered my grandfather’s abandoned hive in the veld I have kept bees. This has been just a small hobby, the least hives I have had being two and the most five. I have often thought that the most depressing experience a beekeeper can have is to arrive at the hive one day and find there are no bees coming in or out of it. The fires that have raged through the Cape Peninsula in South Africa this week have proved me wrong. Bees will do anything to protect their hive and their queen – as we know only too well, if there is a predator from outside they will attack. But what happens when the predator is fierce, hot and fast – a veld fire fanned by gale-force winds and fed by the dry crackling bush of summer’s end? Bees will then go into panic mode. They will cluster around the queen and fan her constantly, remaining at their posts and doing their duty until they die. The day after the veld fire that raged at the back of our house I walked through the charcoal sticks and white sand towards my hive. Smouldering patches of fynbos were still sending puffs of grey smoke into the air and there was a suffocating smell of ash and burnt wood. Within sight of the hive I stopped. The two supers had burnt out completely. The metal lid was in bits nearby and the outer walls of the brood box had gone. Remaining on the metal stand were about five brood frames, totally charred and balanced at a crazy angle across the bottom of the stand. I went closer. 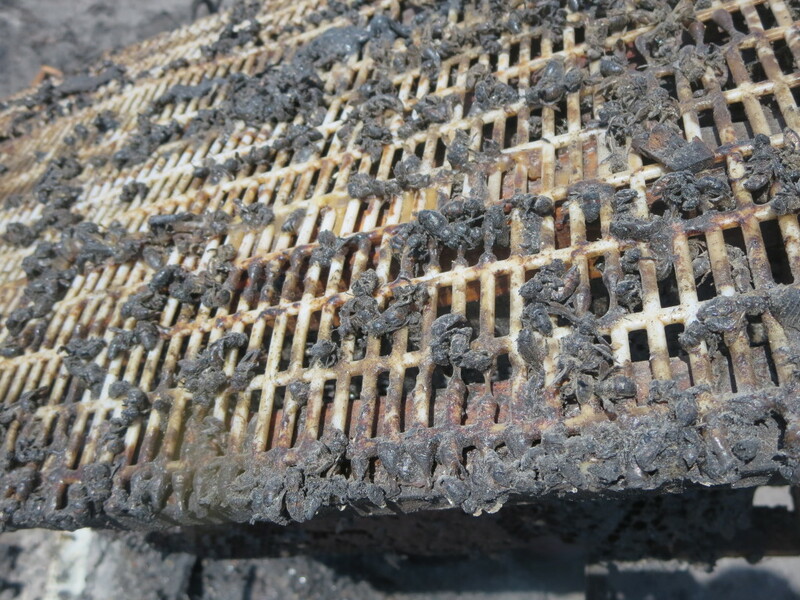 The five blackened frames were stuck together, and hundreds of dead bees lay all across the top. Although the brood was there it was fairly solid and unrecognisable. 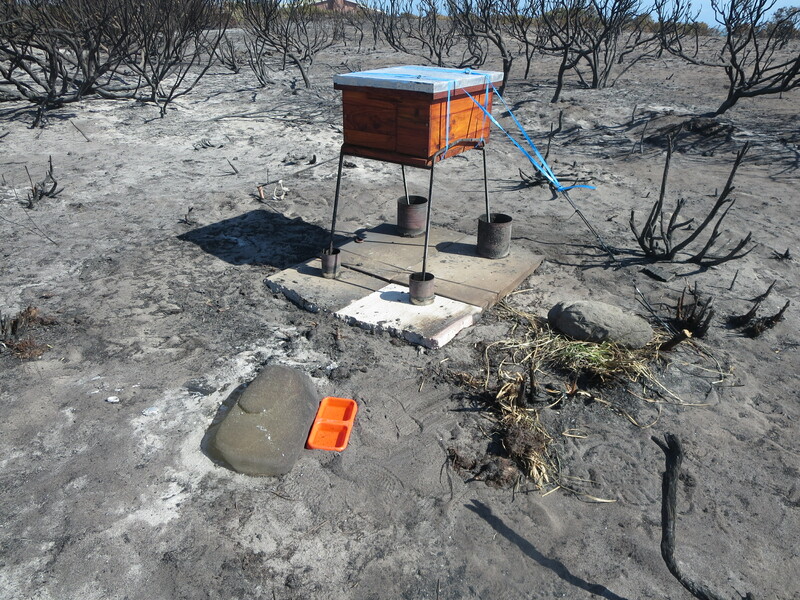 ‘What happened here’ I wondered ‘did the bees fan to such an extent that these centre brood frames could not actually burn?’ Almost too incredible to believe as everything in the surrounding veld had gone. 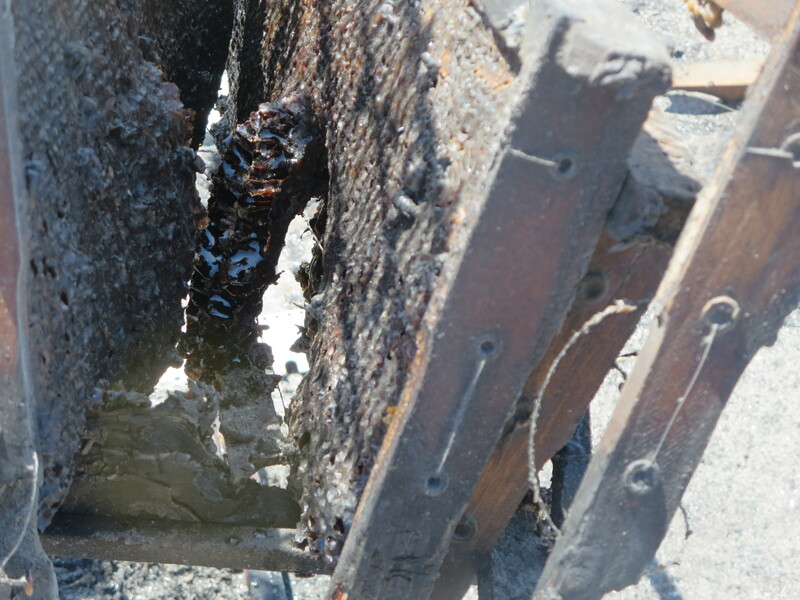 I lifted the charred mass, peering closer at the dead bees – some had lost their wings, some looked more like oval toffee. Then I saw a tiny flutter, and to my utter amazement one whole bee crawled out of the charcoal brood and towards my hand. No more than one. But, as I kept holding the five frames, a few small drops of golden honey dropped onto the white sand. The Cape honeybee has an almost unbelievable ability. Under extreme circumstances, and if they lose their queen, they are able to ‘morph’ a new queen from a worker bee. Now I don’t know if they have lost their queen, and I don’t know how many bees there are to help that one survivor. But I do know that it was quite the most depressing and humbling sight I have ever seen. How those bees must have fought to survive the extreme heat and smoke inhalation is beyond me. With a probable failure risk of about 90%, I have now taken a leap of faith. I happened to have a spare super and a couple of unwaxed but wired frames in my storeroom. (Wax moth is prevalent here and I have just lost my other hive to it). I put the new brood box on the stand, placed the charred stuck-together mess of frames into the centre, and a few new frames into the brood box with them. I stood the feet of the stands in tins filled with oil (black ants are ferocious here). I tied the box and lid together and staked it down into the sand (baboons are also prevalent here). I even put a little dog’s bowl of water down, although the wind and the sun will drain that pretty quickly. Re-hived and battened down – can the hive recover? Then I stood by and watched the entrance. Two bees crawled out, both wingless and too pathetic to watch. Then one more, whole, traumatised bee crawled out, fell onto the sand, crept around for a bit and finally flew off to a nearby patch of tiny unburned veld. I waited and watched for some time, but saw no more. I do not live in that isolated place and so have had to leave. The earliest I can go back is in a week’s time. Will that one bee have others trying to eat their way out of the charcoal to join it? Is there a queen in the middle, still protected? Are there any eggs? What can they possibly do with that charcoaled brood, which should be thrown away but contains their only honey store? I do not know, but like any rescue operation, if you can help even one survivor then you have at least done the very best that you can do. ‘Veld’: a loose term for uncultivated land in South Africa.